Ah yes, the Garage again. 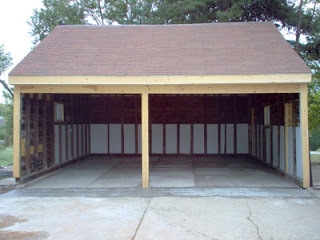 For those of you who remember, this is what the garage looked like in the beginning. It was an overgrown, neglected and unusable space. We were required to tear it down or else get it up to speed (new roof, new concrete floor, new exterior paint, etc). While tearing it down probably sounded like the easiest solution considering the massive amount of work we had ahead of us, we just couldn't destroy this sizeable garage. It was built the same time as the house, therefore it is over 100 years old. This clapboard sided, wood timber sill, real-sized 2x4 framed structure deserved the same respect as the home. So, we dove right in. 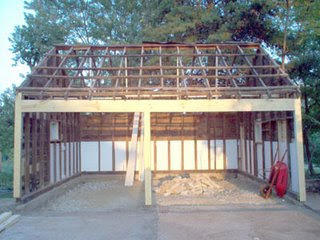 Below is the garage minus roof and floor. 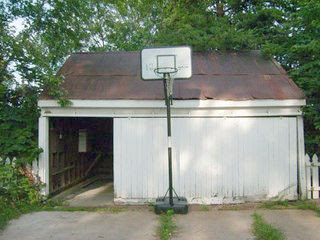 And here my friends is the garage now. It has a new shingle roof, brand new concrete floor and we are painting the clapboard siding this coming weekend. Isn't she a beauty? You will notice two things. First, how bright the surrounding area is now. We had some tree removal done in the backyard and therefore it lightened up the area considerably. Second, the large sliding doors were the one casuality of the project. The garage will essentially remain a large carport until I can figure out exactly what I want to do to replace the doors.